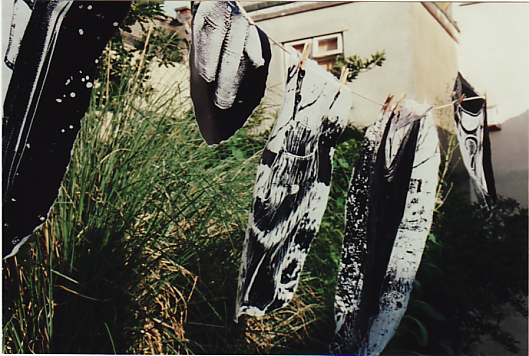 16 years ago 5 artists took up a residency in 1 Bloy St. Bristol – a condemned house on a condemned street – with the intention to make a performance. we worked by flashlight, in dark evenings behind eerily shuttered windows – it is freezing cold. we don costumes and play with dolls. we create acrobalances and hear a text spoken from the dark of another room. sometimes we write texts and share them in spattered sunlight. spring is coming and the abandoned gardens reveal hollyhocks, a shed full of aquariums and a house along the block infested with fleas. it feels anarchic and very convivial – we become a family, fictionally and otherwise. we are a family of children abandoned. we are also a company. we find a name – by word of mouth.